Two of my favorite new Google products of the last nine months are Google Expeditions and the Cardboard Camera app. This week at BETT Jim Sill introduced me to the beta version of the new Google Expeditions Android app. The Expeditions Android app will bring much of the imagery and experience of Google Expeditions to your Android tablets and Android phones. The app is still in a closed beta period that is only open to teachers who apply to download the app. Expeditions uses an app on the teacher's tablet in conjunction with the Cardboard viewer to guide students on virtual reality field trips. Today, Google announced that they are bringing Expedition demonstrations and the required kits to schools all over North America, Brazil, the United Kingdom, Australia, and New Zealand. During the 2015/2016 school year the Expeditions Pioneer Program will be visiting schools to set them up with the materials needed for taking students on more than 100 virtual field trips. Visit the Expeditions Pioneer Program website to find out if the program will be near you and to register your school for a visit. What is the Cardboard Camera app? Cardboard Camera is a free Android app that enables you to create your own virtual reality imagery to use in Google's Cardboard Viewer. With the Cardboard Camera app installed on your Android phone or tablet you can capture 360 degree panoramic imagery. If you choose to keep your phone's microphone turned on, you can capture sound with your imagery. To capture imagery simply open the app, tap the camera icon, then start recording. Slowly move your phone from left to right and turn 360 degrees to completely capture the images around you. Cardboard Camera will tell you if you are moving too quickly or too slowly. Once you've captured your imagery you can view it through the Cardboard Viewer. Unfortunately, the Cardboard Viewer is not free but it is inexpensive. 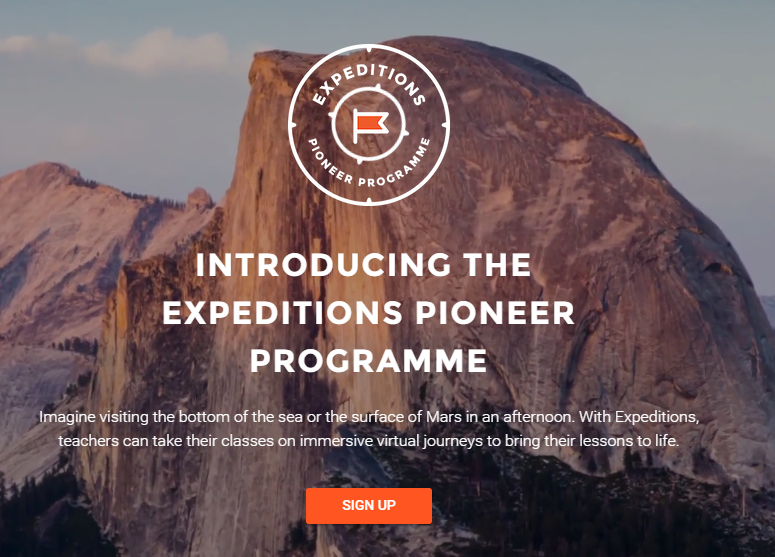 Schools that are selected for the Expeditions Pioneer Program will get viewers for free.